As a homeowner, you have many legal rights that you can and should assert against your mortgage company. With skilled and aggressive legal representation on your side, you may be able to stop the foreclosure and even successfully countersue your mortgage company. 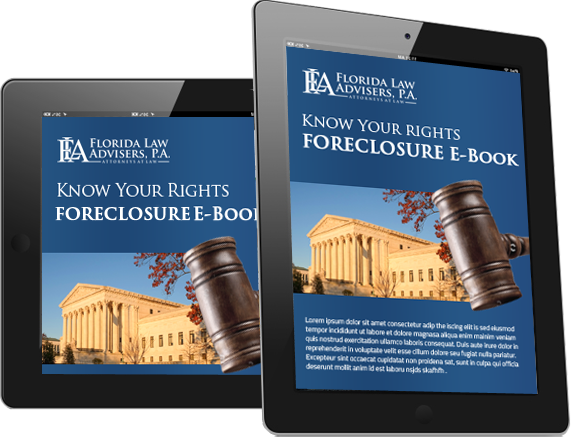 The foreclosure defense attorneys at Florida Law Advisers, P.A. have years of experience protecting homeowners and fighting unscrupulous mortgage companies. The lender will be fighting vigorously to foreclosure on your home, and you should have an aggressive Tampa foreclosure defense attorney on your side to protect your rights. If you have been threatened with foreclosure contact us today to learn about your rights and how you can countersue your mortgage company. In 1968, Congress enacted the Truth in Lending Act (TILA) to protect borrowers from unscrupulous lenders. The act is designed to promote the informed use of consumer credit by requiring standardized disclosures, which highlight the terms and cost of the loan. TILA requires that mortgage companies disclose all pertinent terms, costs, and fees associated with the mortgage by using standardized forms. At Florida Law Advisers, P.A., we take an aggressive approach to defending clients faced with foreclosure. We carefully scrutinize all of the mortgage documents and loan terms to identify any possible violation that we can use to fight the foreclosure. Our attorneys have years of experience helping homeowners in the Tampa Bay area stay in their homes, and can readily identify TILA violations. If we do uncover that your lender has committed TILA violations against you, we will aggressively seek the maximum penalty allowed under the law. If you would like to have a foreclosure defense lawyer at your firm review your loan documents, contact us to schedule a free consultation.